Mix dry ingredients in a large bowl. In a separate bowl combine all the wet ingredients (including peanut butter) until very well mixed. Add the dry ingredients to the wet. Stir to mix well. Refrigerate dough for at least thirty minutes. Line a cookie sheet with parchment paper. Spoon dough by tablespoon fulls onto cookie sheet and flatten slightly. 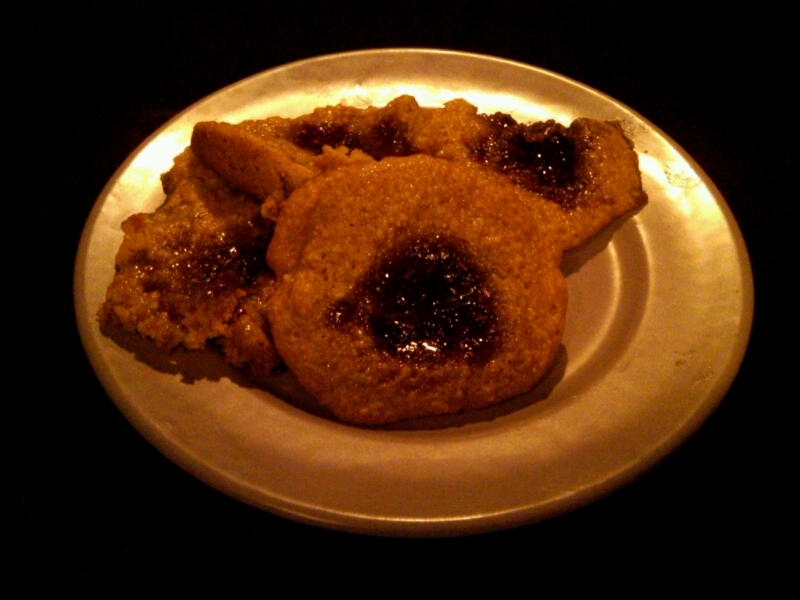 Put a little jam in the center of each cookie. Bake for 10-12 minutes. Cookies will still be soft. The bottom should be a golden dark brown. — Note – when I last made them I made the cookies kind of big, and I ended having to bake them for about 22 minutes.